الخيار الأفضل للحصول على المتعة والاسترخاء، Nomads Auckland Backpackers Hostel يقع في منطقة رائجة من أفضل مناطق المدينة. إن موقع الفندق الاستراتيجي، الذي يبعد فقط عن مركز المدينة، يسمح للنزلاء بالوصول سريعاً وبسهولة إلى العديد من الوجهات المحلية المثيرة. يشكل هذا الفندق ملاذاَ مريحاً للاسترخاء ويمنح زواره فرصة للاستجمام والتجدد، وهو يقع على بعد خطوات من المعالم السياحية الكثيرة للمدينة. إن الخدمات الممتازة وحسن الضيافة العالي في Nomads Auckland Backpackers Hostel تجعل إقامتك تجربة لا تنسى. يقدم هذا الفندق العديد من الخدمات الكفيلة بإرضاء أكثر الضيوف تطلباً. ادخل إلى واحدة من الغرف 74 وتخلص من عناء نهار طويل بمساعدة مجموعة كبيرة من الخدمات كمثل سجاد, بياضات, مرآة, إغلاق, كاشف دخان الموجودة في بعض الغرف. صممت خدمات الاستجمام في الفندق والتي تتضمن ساونا, مسار جولف - ضمن 3 كم, سبا لمساعدتك على الاسترخاء والراحة. إن Nomads Auckland Backpackers Hostel هو خيارك لخدمة الفنادق الراقية في المدينة. Big noise all the time from the hand dryer devices mounted in the bathroom on the wall where my bed was on the other side of the wall in the neighbor dormitory. The hostel was not willing to take any action or offer compensation. Perfect location, nice people, lovely and helpful staff! This place is truly good. They maintain their facilities and keep it quite at night. Even tho I lost my towel, but i had good quite sleep at night. Thanks! Located near everything including bus stops to airport and hop on/off bus. Close to shopping and food area. Very good for backpackers and young folks, not ideal for Couples as the Double Rooms are tiny, untidy (ours had bed bugs too). Staff was lovely! Perfect location and super cheap! We were informed that there was a mix-up with Agoda and hostel was overbooked for the type of rooms. Frontdesk gave us the closest equivalent (double room without shower), and made a small (and much appreciated) gesture of goodwill. Room had window, was clean, just got a bit noisy at night given the partying crowd on street. Overall, good value for money, and would recommend to others. I was in a room where I wasn’t having a good wifi signal. I was paying 12$ for 7 days wifi so I could get wifi in my room and not only in common areas. Worst thing I did. I was rarely getting connected and when I was connected it was really really slow. Of course I talked about this situation with the staff that couldn’t do anything about it. Receptionist girl who works there arguing with me lol. She doesn’t have any idea about how to treat customers, besides trying to teach me how shall I do my account name etc ... really !! only her was a problem and The other staff which by the way was way much nicer ! She doesn’t do good her job! And now I understand why people complain about the place besides very noisy in the rooms plus drinking people inside the room and dirty rooms! Each level has different accomodation. I chose the one with a private bathroom and it was clean and tidy. They have a kitchen and a lounge room for all to use. They also have nights were they have a get together with hotdogs and sausage sizzle. Best thing is it I right in the middle of the town so it is a great location. We arrived in Auckland after 13 hour flight. We changed rooms because the double bed would not have worked for both of us. The rooms were disgusting! It smelled so bad. I was surprised the showers had hot water. Overall, we would not recommend this place. Excellent location, just near the transport centre and the wharf. Nice staff and bathroom. The problem is the kitchen is too small for such number of people, which make the dining place with nice view very crowded during peak time. 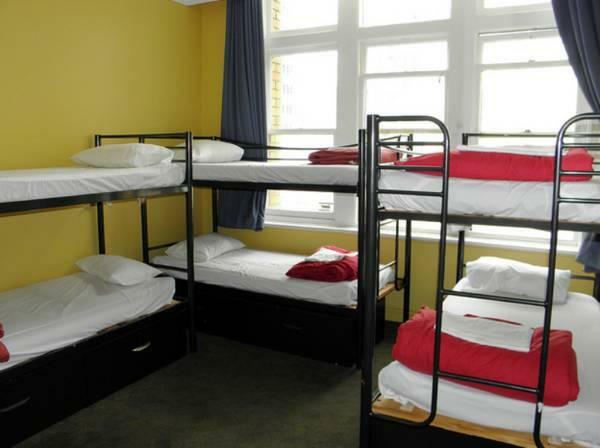 It was an awful experience when I spend two nights in Nomads Auckland Backpackers Hostel, a single private room. But first of all, I appreciate the staff in front desk are really helpful and nice, the location of hostel is great. However, there's water keep falling down from the ceiling inside the bathroom all over the night, and I don't know where's the water comes from, is that rain? or just someone's bathing in the upper floor? That makes me feel terrible. Last but not least, there's obviously some dirt/stain on the blanket, I wonder if there's any cleaning after the backpackers checked out. It was really an terrible experience and I would never go back and would never recommend to a friend.